Last year’s Rockets nearly pulled off the seemingly impossible, a team that nearly punched a ticket to the Finals when it established a 3-2 series lead over the juggernaut Warriors in the Western Conference finals, only to crumble in the last two games with star guard Chris Paul injured. 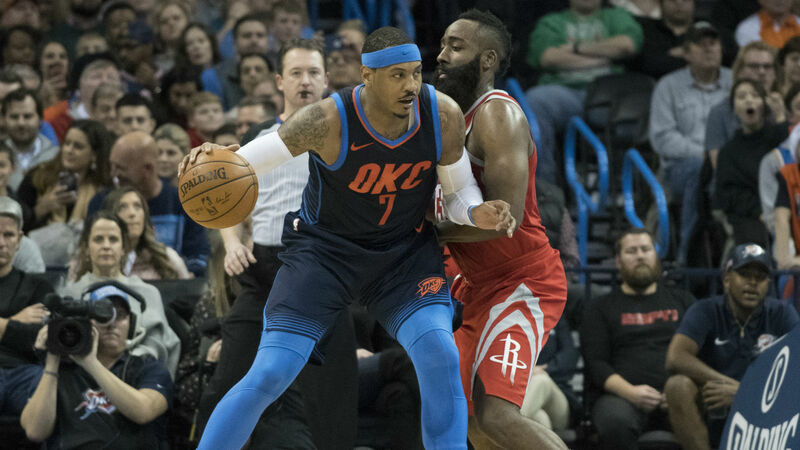 Rather than running back the same group, the Rockets instead lost two key role players in free agency, starting small forward Trevor Ariza and key reserve Luc Mbah a Moute, both of whom were vital to the Rockets’ turnaround on defense. Houston jumped from No. 18 in defensive efficiency to No. 6 in one year. Worse, Anthony has a history with Mike D’Antoni, who revived his coaching career in Houston after a flop with the Lakers that came on the heels of his flop in New York. It was with the Knicks that D’Antoni and Anthony butted heads frequently. Chemistry has been a touchy issue in recent Rockets seasons, but was mostly smooth last year. The Anthony-D’Antoni dynamic threatens that. It’s easy to ding the Rockets for all this, and we’ve partaken in that criticism. But looking at the way events have unfolded in Houston, there was not much other choice for Morey, and perhaps it’s best to give him the benefit of the doubt as the team comes together. The Rockets had little choice from the start of free agency but to re-sign Paul — who agreed to opt in to the final year of his old contract last summer to facilitate his trade to the Rockets — to the four-year, $160 million contract he got early this month. The Rockets have yet to finalize a deal with restricted free agent Clint Capela, but that deal figures eventually to come in at around $22-25 million per year. The problem is that the Morey’s Plan B has been underwhelming — so far, at least. Anthony can score, and there’s some hope he can massage his game into fitting better with the offense that the Rockets and D’Antoni employ. There might be less hope that Anthony can fit into the defense installed by assistant coach Jeff Bzdelik, who was Anthony’s original coach in Denver in 2003-04 and (surprise, surprise) had some clashes with his budding young star back then. The Rockets could find other ways to fill out the depth chart, though. They expect that second-round rookie De’Anthony Melton, who impressed in summer league as an open-floor player capable of becoming a lockdown defender on the wing, will be a rotation player in his first season. There’s also the possibility that the frontcourt gets a boost from youngsters Isaiah Hartenstein, a defensive center who played in the G-League last year, and 7-2 perimeter forward Zhou Qi. And don’t count out Morey’s ability to get creative. He has a good record of unearthing NBA-quality players where no one else is looking, even if they don’t stick with the Rockets — Patrick Beverley, Garrett Temple, Ish Smith and Robert Covington are examples. This was not the ideal summer for the Rockets, no doubt. But on further consideration, there was logic in Houston’s decisions, and things may still work out for Morey in the end.